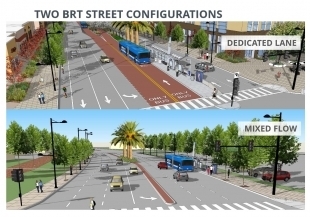 A proposal by the Santa Clara Valley Transportation Authority (VTA) to establish dedicated bus lanes and remove more than 250 parking spaces on El Camino Real in Palo Alto is meeting vigorous resistance from city officials, who are questioning the assumptions behind the ambitious plan known as Bus Rapid Transit and calling for the agency to consider alternatives. VTA is preparing to certify the draft environmental analysis for the project, which aims to increase ridership and make bus trips speedier. Many details of the plan, which has been in the works for more than five years, remain undecided, as the agency is still evaluating which parts of El Camino should have dedicated bus lanes (and, by extension, fewer car lanes) and which should have a “mixed-flow” configuration in which buses share lanes with cars but pause at bulb-outs and new stations. The Palo Alto City Council is set to consider Monday the latest iteration and sign off on a letter opposing the proposal to dedicate two of El Camino’s six lanes to buses only.